22mm RDA (Rebuildable Drip Atomizer). Fully-functional AFC (air flow control) for any coil configuration - single, dual, or quad coil. You can open 1, 2 or 4 holes with adjustability. Firing chamber is condensed as much as possible, and optimized for flow with zero hard edges. Flavor and draw is unparalleled. 4-hole post design for simplicity and functionality when building. 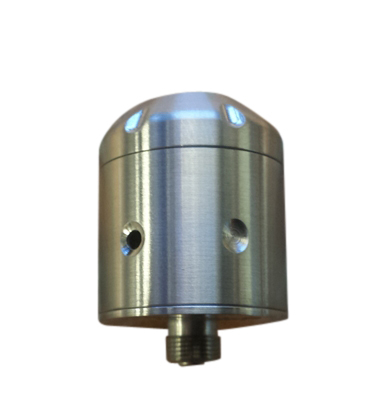 304 Medical Grade Stainless Steel construction with Delrin brand insulators. Sub-Ohm: Sub Ohm vaping is inherently dangerous and injury can occur if certain safety guidelines are not always followed. You must be also ensure that your batteries can handle sub ohm atomizers and coils. If you're using a regulated mod, make sure it can handle the amps. Sub-Ohm coils are for experts, not average or beginner vapers with no multimeter or knowledge of how to use a meter, or when a meter must be used, or how electronic devices work. If the coils are not built or tested correctly this can irreparably damage your devices i.e. Mods, Batteries Tanks etc. and may also cause personal injury. These materials cannot safely be used by the inexperienced or those without basic knowledge of electronics, ohm's law, and amps! Sub-Ohm coils will only work on a mechanical mod or a regulated mod capable of firing sub-ohm atomizers and coils. A coil MUST be tested carefully with a calibrated meter before it is used. If it is not tested it may damage the device it is used on. Faulty wicks/coils WILL blow electronic devices. New coil/wick units must be tested and then used first on a strong basic electrical APV such as a Silver Bullet, that will not be destroyed by a short circuit. No new coil/wick assembly should be used on an electronic device until known to be safe. These items destroy electronic devices if faulty. These items have inherent risks and may go faulty at any time even if they were originally in good working order. The owner bears the cost of equipment damaged as a result. Make sure that your battery is either removed from your mod, or your mod is adequately locked when you are building your coils. "Mods" are by definition a modification to a design. There is a degree of risk inherent with any device that uses lithium type batteries. Some of the dangers are short-circuiting, reverse battery issues, and exceeding voltage limitations. Understanding how to handle and care for Lithium type batteries is very important and should always be practiced. Lithium type batteries are very sensitive to charging characteristics and may explode or flame if mishandled. This is an advanced user device which is recommended for use by experienced vapers only. It requires you to have a strong technical knowledge of mods in order to use this device properly, and safely. Indy Vapor Shop will not be held responsible or liable for any injury, damage, or defect, permanent or temporary that may be caused by the use of any battery. Indy Vapor Shop is not responsible for any device malfunctioning due to use by an inexperienced vaper who does not have the knowledge and understanding of how to use, and properly rebuild advanced e-cigarette devices. Please have a basic understanding of the batteries you are using and how to care for them properly. Read the information found at: Battery University before purchasing. It is important to carry batteries properly, recharge properly, and dispose properly. Since we have no control over how a buyer uses the product; no guarantee, warranty, or return privilege will apply. The manufacturer may offer a limited warranty. Buyer shall be responsible for returning the product to the manufacturer. We regret having to strictly enforce this policy. The use of DIY liquid, improper chargers, modified atomizers, and general abuse of the product has made it necessary. Please do not order if you do not understand and accept these terms.